The most dedicated of culinary adventurers take pride in venturing into the borderland between what’s exotic and what’s toxic. For some, casu marzu, the Sardinian cheese whose name translates to “rotten cheese”, might stray too close for comfort to the latter. 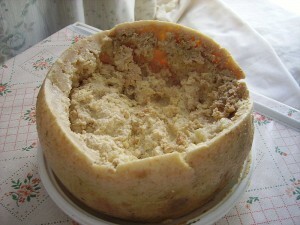 It’s illegal throughout Italy (though it’s sometimes available on the Sardinian black market), and for obvious reasons: larvae of Piophila casei flies are introduced into a pecorino before its fermentation begins by lopping off the top of the rind and left out for flies to lay their eggs, then re-covered and aged in dark huts. Some producers add milk or olive oil inside as well as a drop of brandy or whiskey on the rind to ensure proper texture and taste. The resultant larvae help break down the cheese’s fats until the texture turns viscous and a liquid known as lagrimas, or tears, seeps through the rind. The larvae themselves have garnered the name “cheese skippers” because of their extraordinary agility; diners must take care to eat around them, since when disturbed they can leap up to 15 cm (6 inches) in the air. The alternative is to cut a wedge off and zip it up in a plastic bag. Then you wait until the pattering sound of worms hurling themselves against the sides of the bag lets up, and eat it with red wine and pane carasau, a kind of crisp flatbread. Casu marzu gained notoriety when the Guinness Book of World Records deemed it the “world’s most dangerous cheese” in 2008, citing effects ranging from the mundane (vomiting) to the grisly (bloody diarrhea). Still, about a hundred thousand kilograms (about 220,000 lbs) are said to be produced in Sardinia each year, going for about 20 euro per kilo, which adds up to roughly 2 million euro per year made from its sale. And if you ask the right people, you can find regional variants elsewhere—saltarello friulano from Friuli, for example, or cacio puntato or marcetto from Abruzzo, and others made by introducing Piophila casei into unaged cheeses besides pecorino. For the iron-stomached, an industry to be reckoned with.